His Excellency, the Governor of Arunachal Pradesh inaugurated the new school auditorium (Eknathji Centenary Bhavan) and the Primary sections on 16th July ‘2015. He was welcomed by a troupe of Rikom Pada, the famous folk dance of Nyishi community and School band troop near the gate. VKV Banderdewa students gave the Rashtriya Salute with band. Dr. Joram Begi, Prant Pramukh welcomed the Chief guests. Dr. Tejum Padu, Trustee VKVAPT felicitated His Excellency the Governor of Arunachal Pradesh, Dr. Joram Begi and Sri Bhanudasji, the General Secretary of Vivekananda Kendra & Vivekananda Rock Memorial. Sri Bhanudasji highlighted Mananeeya Eknathji’s life and mission behind the construction of Vivekananda Rock Memorial and Vivekananda Kendra, whose birth centenary we are celebrating this year. His Excellency the Governor of Arunachal Pradesh lauded the efforts of Vivekananda Kendra in the field of education. Su. Radha Devi Joint Secretary, VKVAPT gave vote of thanks to one and all present for the function. Totally 412 parents & eminent invitees from various departments were present in the hall. The children of VKV Itanagar, Vivek Vihar and Banderdewa cheered the governor from outside during his arrival and departure. They viewed the live program on Plasma T.V. The new academic session has just started and you are coping with the rush of parents clamouring for admission for their wards. Such rush is a sign of immense faith in the system which is a matter of pride and joy for all of us. Session being started, I am sure that the schools have planned various programmes to ensure all round development of the students. I was fortunate to represent the organization in two of the forum to speak about the importance of the Yoga. The first one was at Guwahati University on 21st June. The seat of higher learning was ready with all the preparation to celebrate the event befittingly. After my address, I could interact with the students and faculties over there. The second one was at Assam Medical College on the next day wherein the students of Pharmaceutical Department in Assam Medical College, Dibrugarh attended. Let this be a great opening for the world community to realize the message of our Land. As the schools had annual vacation in April & May, did not share the events that had happened from March to June. Let us have a bird’s eye view of the same. As an attempt to involve the parents who are the important stakeholders in the educational process, an Abhibhvak shibir for the selected parents from all the VKVs of Arunachal Pradesh was organized in VKV Itanagar from 20 to 21st March 2015. A total number of 34 parents from various parts of Arunachal Pradesh participated in the shibir. Reverend Swamini Pramananda guided the parents on various aspects of life. The ways to play a greater role in the society were prescribed. Focus was also given on the values required to instill in our children. In addition, there were important sessions on parenting and various topics by Dr Joram Begiji, Prant Pramukh, Sri Pai Dawe and Sri P.M.Unnikrishnan. The parents also enthusiastically took part in group discussions and presentation on different aspects of parent’s involvement as the school supporting group to enhance the efficacy of the functioning of the schools. A unique shibir namely ‘Dhyeyamarga’ was organized from 22nd to 24th March in VKV Itanagar for the teachers who have served for more than 15 years in the VKVs of Arunachal Pradesh.71 teachers from various VKVs of Arunachal Pradesh attended the shibir. Pujya Swamini Pramananda from Purna Vidya Foundation was the main guiding person in the shibir. The discourses of reverend Swamini were studded with pearls of wisdom culled carefully from our parampara. In this spiritual retreat, all journeyed to the core in order to get the eternal revelations. The teachers also revisited their goals to pursue it with renewed energy. In the long sessions of introductions all the teachers pondered on various instances in the bygone days in VKVs. All the teachers reaffirmed their conviction to put their heart and soul in the noble work of Vivekananda Kendra to make Arunachal Pradesh a model state to materialize the plan of Mananeeya Eknathji Ranade. 85 teachers from VKVs of Itanagar, Vivek Vihar, Balijan, Nirjuli and Banderdewa attended spiritual discourses by Swamini Pramananda on 25th March at VKV Itanagar. The entire family of VKVs was gripped with sorrow with the demise of Sri. SNS Reddyji at around 3.45 on 26 March. SNS Reddyji from Andhra Pradesh joined as a teacher in VKV Kharsang in the year 1979. He continued to put his heart and soul in the ‘Man making and Nation Building’ endeavor of VKVs rejecting many lucrative opportunities offered to him in other fields. In his long tenure of service he offered his service as teacher and Principal in various VKVs like Kharsang, Amliang, Jairampur, Seijosa, Tafrogam, Itanagar, Shergaon, Nirjuli, and Yazali. He got superannuation in the year 2013 but continued to render his service to the VKVs. A man of quite composure, he was a selfless and devoted teacher of VKVs who saw many VKVs developing from a primary to a full fledged school serving the remotest places in Arunachal Pradesh. He was considered as a very inspiring teacher who produced many alumni who are in turn serving the society with various capacities. He was also a proud recipient of CBSE Best Teacher Award in 2005. For a short stint he also served as the Education Officer of Vivekananda Kendra Vidyalayas Arunachal Pradesh Trust. He will remain as a source of inspiration to many to offer our best to the society and will be a living example of the selfless service to be offered to the society of Arunachal Pradesh relinquishing everything personal. The whole family of Vivekananda Kendra offers tribute to this great soul. The Varshik Baithak of Vivekananda Kendra, Arunachal Prant was conducted on 7th and 8th March 2015 at VKV Nirjuli. The Baithak took the stock of the activities related to the celebration of Mananeeya Eknathji Janma Shati Parva and other Kendra activities. Planning for conducting of Janajati Sammelan, Yuva Sammelan etc were done. Mananeeya Pravinji, Dr Joram Begiji, Dr Tejum Paduji and Sri Rinchen Dorjiji guided the karyakartas. The members of VKVAPT were also present in the Baithak. 16th Acharya Prashikshan Shibir was conducted in Kanyakumari from 1st to 25th April 2015 in which 142 teachers attended from the VKVs of Arunachal Pradesh, Assam, Nagaland and Andaman and Nicobar Island. The shibir provided comprehensive training to the teachers in respect to Kendra ideology, Indian Culture, teaching skills and various other topics which have enriched the teachers immensely. The participants were busy right from the morning to evening in myriad of activities like prayer, yogasanas, various group activities, attending lecture sessions, practice teaching, Patriotic song and Bhajan practice, story telling sessions, Kridya Yoga, visiting important places etc. Many important topics were dealt with like the series of lectures by Mananeeya Nivedita Didi on ‘Indian Culture’, Teaching Skills by Sri. Unnikrishnan P.M., Mananeeya Balakrishnanji on ‘ Role of VKVs in Nation Building’, Bhanudasji on ‘We’, Pravinji, on ‘Vivekananda Kendra –A thought Movement’ and Hanumanta Raoji on ‘The Story of Vivekananda Rock Memorial’, Dr Lakshmi Kumari on ‘Swami Vivekananda’, Prerana Srot & VKV Teachers by Radha Devi, ‘Projects and Assignments’ by Sri Ravi Savadeykar, Karya Paddhati theory and practical by Sri Kamalakant, Sri S.P Verma, Director of Vidya Institute of Teacher training and Development took sessions on different aspects of CCE and Classroom Management. 19 selected students from 7 different VKVs from Arunachal Pradesh namely VKV- Nirjuli, Vivek Vihar, Itanagar, Ziro, Shergaon, Roing &Tafrogam attended 7 Days Science Workshop organized exclusively for VKV students by Vigyan Vahini Pune, Maharashtra from 1st June to 8th June 2015. Students were given hands on experience in conducting various science experiments by the subject experts of Vigyan Vahini. In addition to these, they were exposed to archery and rifle shooting. The topic covered in the workshops were the concepts in Physics and Chemistry , fun with Maths, making toys from scraps, Life in space, Nano Technology, Economic literacy, experience the joy of handling live snakes and much more. The students were taken to Tata Motors, Inter University Centre for Astronomy and Astrophysics (IUCAA), Indian Institute of Science Education and Research (IISER), Indian Air Force Station in Pune and Naval Ship in Mazgon Dock, Gate way of India, Hotel Taj and Nehru Planetarium of Mumbai. Students got chance to interact with Dr. Jayant Narlikar, founder of IUCAA and recipient of Padmabhushan, Padmavibhushan and Kalinga award by UNESCO; Sri Suhas Kane who stayed 14 months in Antarctica; Sri Umesh Ziper and Sri Joshi who conquered Mount Everest. The most interesting part of the camp was arrangements done by the organizers to stay with Marathi Families for the exchange of culture and tradition of both Arunachal Pradesh and Maharashtra. They relished Maharastrain dishes and students narrated rich cultural heritage of the state. The commitment of Vigyan Vahini team in particular Dr Sharad Godse who was the coordinator of the workshop to spread scientific awareness and their zeal to selflessly contribute for the nation is a matter of great pride for all of us. CBSE declared the results of Class XII and X on 25th and 28th May 2015 respectively for the NE region. The VKVs of Arunachal Pradesh could exhibit a good result in both the levels. A Class teachers’ Workshop was conducted in VKV Nirjuli on 21st June, 2015. The workshop was attended by 35 Class teachers of Class IX and X from 13 VKVs from Arunachal Pradesh. The workshop began with an assessment of the Class teachers in which questions relating to all the aspects of Class IX or X were asked. The assessment was for 50 Marks for 1 hour. The inauguration program which started immediately after the assessment was graced by Dr Joram Begi, Prant Pramukh of Vivekananda Kendra, Arunachal Pradesh Prant having the additional responsibility as the Director of VKVs in North East and Sri Arvind Gore, Educational Consultant from Pune. 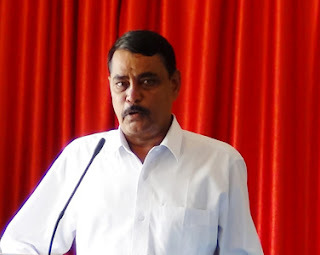 Sri P.M.Unnikrishnan, Education officer of VKVAPT welcomed all and explained the objective of the workshop. One of the main objectives of the workshop is to explore the potentiality of the Class teachers to get targeted result in the Class X Board examination. After the inauguration, the result of the last Class X examination was analyzed which was followed by a session by Sri P.M.Unnikrishnan on the role of Class teachers and the essential information a class teachers should have. Sri Arvind Gore took two hours session focusing on the multifarious role a Class teacher should perform in order to identify and nurture the variegated talents of the students in the classroom. International Yoga Day was celebrated on 21st June with lot of enthusiasm in all the VKVs of Arunachal Pradesh. Special programs on Yoga were organized which included discourses, demonstrations etc to mark the occasion. All the staff of VKVAPT also practiced Yoga in the Administrative office, Dibrugarh. In all the places we could observe eagerness of all to know and practice Yoga for a better life. An academic auditing was conducted by Sri Arvind Gore, an educationist from Nagpur and two of his team mates in VKV Nirjuli. Observation the classes of all the teachers, Feedbacks to all the teachers, Teachers’ workshop for imparting new methods of teaching, maintenance of school records etc were the areas concentrated by the team. 2 day workshop for the teachers of VKV Nirjuli was conducted on 27 and 28 June 2015. 37 teachers attended the workshop. Sri Arvind Gore was the main resource person for the workshop. In addition to the detail discussion on the qualities required to be a good teacher, many new teaching techniques were made practiced. All the teachers participated actively in the workshop and are ready to use innovative techniques in teaching in order to enhance the students’ participation and learning. Classes for the students on Problem Solving Assessment were organized for Class IX and X in VKV Itanagar, Kharsang and Jairampur on various dates in the month of June by experienced Resource persons. Sri Prashant Divekar, Head, Teacher Training Centre of Jnana Prabodhini, Pune and Sri Amar Paranjpe, Assistant Professor in Walchand College of Engineering who is associated with Jnana Prabodhini for student training for competitive examination were the main resource persons. Problem Solving Assessment of CBSE is an assessment of qualitative, quantitative and language aptitudes of the students. A week long Pole and Rope Malkhamb Coaching camp was conducted at VKV- Jairampur from 24th to 30th June 2015 in which 55 selected students from VKV Kharsang, Jairampur, Roing, Tafrogam, Sunpura, Amliang and Oyan and 12 Selected Physical Education Teachers participated. Eminent Pole and Rope Malkhamb mentor Sri Uday Deshpandey from Maharashtra having international repute was the Resource person for the Coaching Camp. The rigorous training from 5.30 am to 8.30 pm equipped the 55 students and 12 Physical Education Teachers to learn and various skills in the event and equipped them for the excellent show which was put up on the concluding day on 30th June at VKV- Jairampur. I could attend the spectacular concluding function in which Shri. Kento Riba, ADC of Jairampur lauded the efforts of VKVs in promoting the sports and Games in the State. An orientation program for the Class XI students and parents was conducted in VKV Roing on 28th June which was graced by Mananeeya Pravinji, Secretary, VKVAPT and Sri Rupesh Mathurji, Prant Sangathak, Vivekananda Kendra, Arunachal Prant. 39 students and 36 parents attended the Orientation Program. Sri Pravinji spoke on the topic ‘Role of parents’. A glimpse of the activities of Vivekananda Kendra was given by Sri Rupeshji. Sri T Ravi, teacher of Physics, VKV Roing discussed the need of having good study techniques and ways to stay focused in studies. Dear Sisters and Brothers, new academic session should usher in new prospects and hope.Refurbishing with new energy while celebrating the Mananeeya Eknathji Janma Shati Parva, let us plan and renew our commitment for the excellence in our schools in order to render the best possible service to the society. Wish you a wonderful academic session ahead. “Words have limited concept and import; workers who live the philosophy of the Kendra will propagate the objectives of the Kendra more easily than mere printed or spoken words. We must have such workers of quality in large numbers.” ----Mananeeya Eknathji Ranade.